When setting up a new installation of FunnelFlux you will need a domain name and will need to point this to your server. This requires a DNS management system. Use some other service such as Cloudflare, NS1, Route53, etc. If you want to centralise your domain management to one place we highly recommend you use a platform like Cloudflare. Do not use your server to host your DNS service, as is commonly suggested with managed servers running cPanel. This puts too many critical services in one place -- generally you would use a separate service provider for your DNS management, servers, and emails so that they do not rely on each other. I'm sure you won't need much guidance here. Sign up to Cloudflare. You don't need pro, their free plan will do fine. Add your domain name in Cloudflare. You can do so by clicking the "add site" button in the top right (or on first log in you might be presented with some wizard). Enter your domain name and click scan. 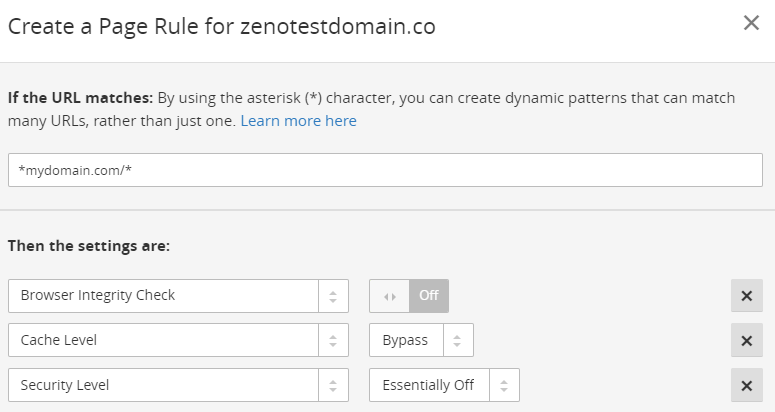 This will give you the option to import existing DNS entries, which you likely won't need to do. You will then go through some steps where you confirm DNS details (just click next), select a plan (use free), and get to a page where it tells you to adjust your nameservers. Note that this nameserver information will also be available on your site's DNS config page later and homepage. Don't panic if you forget these or skip this section. Head over to your domain registrar (where you purchased the domain) and find your domain nameserver configuration. Go to your domains page and click manage for your domain. Make sure to remove any leading/trailing spaces here that may have arisen from copy/pasting, i.e. check formatting. Click the ✔️to save and you are good to go. Note that changing of Nameservers may take up to 24 hours. This process is generally fast if you have just purchased the domain and have not yet tried to load it in a browser. In any case be patient, these changes take time. You can check the status using a tool such as DNSChecker -- enter your domain, change the record type to NS, and then search. You can also do this with A and CNAME records to check propagation when you make changes. You can now go back to Cloudflare and click the Recheck Nameservers button. Do this every few hours until it is happy. 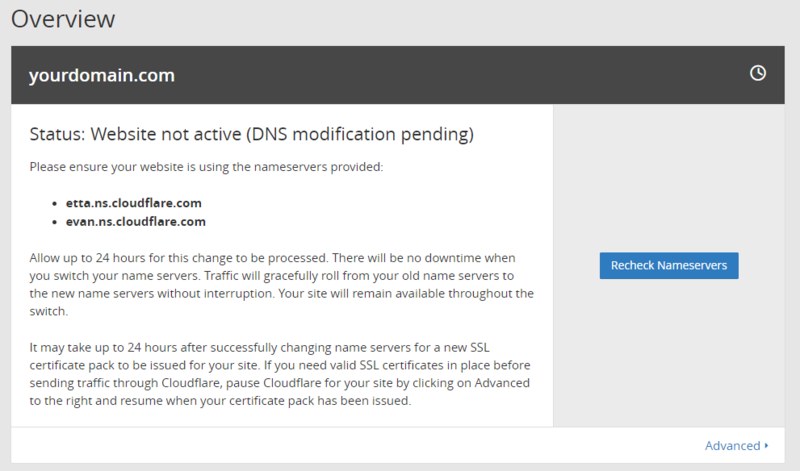 Once you have configured your nameservers you can now get back to managing things in Cloudflare. Pointing a domain or subdomain to your server is easy - you just need an A-record. There are two main types of records you wil use -- A-records and CNAME records. A-records point a domain name to an IP address. CNAME records alias a domain name to another domain name. For example, an A-record might point mydomain.com to 34.122.77.108 . If you haven't yet used our deployment manager or another method to set up your server, go and do that now, or you can just put a placeholder like 123.123.123.123 for the mean time. Automatic TTL is fine but make sure o turn off the caching/acceleration feature by clicking the cloud icon for now. It should be off/gray. We will go through the correct way to configure this for "orange cloud" later below. Now, once you have added the domain the DNS system should respond almost immediately. DNS changes can take time due to expiry of cached values (governed by the TTL value and many systems), but new entries should be immediately available. When running our automated deployment processes the webserver (Nginx) adds a generic host so that it will serve any domain name directed at it. This is useful as it lets you point any domain at the tracker and have it work, although your license will be attached to only one domain, which is the one you must log into the dashboard through. So, for this setup you don't need to do anything more. However if you are running your own server environment, make sure your Nginx/Apache config is set up to add a virtual host for the domain you are going to have the tracker under. If you plan to use CNAME entries to alias other domains to your tracker, make sure to also add these aliases to the same vhost config so that they all serve from the same place. If you have finished DNS setup and deployment, you can load yourdomain.com/admin/ to log in to the tracker, or yourdomain.com/install.php if you need to start the installation. Firstly, find your tracker A-record for your core domain. You can switch this to orange cloud mode, which will cause requests to proxy through Cloudflare's servers first before getting to your tracker. We are going to make changes that prevent issues. Next step, go to the Page Rules section. Here we want to add a page rule that tells Cloudflare to essentially disable security measures and caching. This will match all URLS being requested. Then, set the rules shown below. Save and deploy the rule. Now, you should wait a few minutes, then load your tracker in an incognito window and check all is working as expected. Load it using http and https. Check it works fine. Load a test tracking link, then look at your stats > break down by e.g. ISP, IP, country, etc. and check it is tracking you properly and showing your details. If you see details coming through with random IPs, listing a different country to expected, not listing your ISP etc., then there may be a configuration issue that is causing FunnelFlux to see the Cloudflare server, not you the real user. One of the biggest advantages of Cloudflare is that they generate SSL certificates for every domain you add to your account. If using SSL, its also great to have it handled by Cloudflare in Flexible mode, as the SSL negotiation is fast - i.e. links should be faster than if your server did it. If you want to use CNAME domains, you can also use SSL with these and Cloudflare, but there is one key limitation you need to know about: both these domains must be in Cloudflare on the same account. Just add your other domain to Cloudflare, set up a CNAME record for it (use @ for the name so it uses the root domain for the record you're adding), then go through the same steps above with enabling flexible SSL and adding a page rule. Be sure to test the domain afterward in both http and https forms to ensure it works. And that's it! You now have free SSL on all CNAME domains through the magic of Cloudflare.